I pitched to Enos Slaughter when I was a freshman at St Anthony's College in San Antonio. I was brought in as a relief pitcher because the Air Force team had pounded our starting pitcher. I honestly believe that my pitch Slaughter hit was the first US object launched into orbital flight: it might still be circling around up there today. And the next batter, as I recall, was Birdie Tebbetts. Oh, the agony of defeat...but what a great memory! 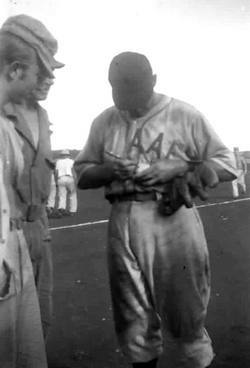 Slaughter began playing second base for the Ca-Vel baseball team and his abilities caught the eye of Fred Haney, the sports editor of The Durham Morning Herald. Haney passed Slaughter's name to Oliver French, who owned the Greensboro farm team of the St. Louis Cardinals. 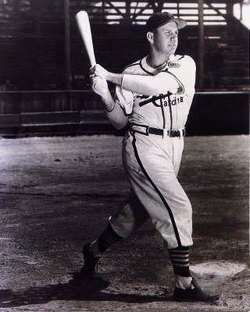 French took Haney's advice and invited Slaughter to a tryout for the Cardinals' organization in September 1934. Slaughter's performance at this tryout earned him a position with the Martinsville Redbirds of the Bi-State League. Enos "Country" Slaughter retired from baseball in 1959. He was a player-manager in 1960 for a minor league team in Houston and for Raleigh in 1961. Slaughter coached baseball for Duke University from 1971 to 1977. In 1985, he was inducted into the Baseball Hall of Fame. Talking about his military service some years later on an episode of ESPN's Major League Baseball Magazine, Slaughter said "The three years I missed really didn't hurt me that much." Created January 13, 2007. Updated March 19, 2007.